Managers seeking to minimize energy waste also should look closely at humidity sensors, which typically are more prone to losing their calibration compared to temperature sensors. The potential for energy waste increases when it comes to humidity control. 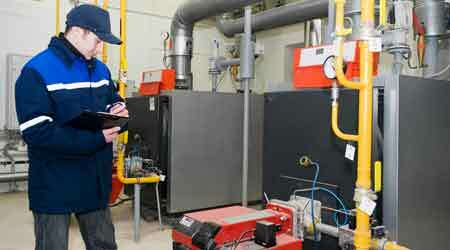 Humidification and de-humidification control are critical for some spaces and processes. Humidity control typically adds clean steam to the airstream to raise space humidity. De-humidification control in some systems relies on overcooling the supply air and reheating it to bring down the humidity while maintaining space-temperature conditions. Cooling for the purpose of de-humidification is always more costly than for temperature-control purposes alone. A humidity sensor that reads 5 percent relative humidity (RH) too high can cause the system to stay in de-humidifying mode longer, which results in cooling and heating waste. A sensor reading 5 percent RH too low will cause the humidifier to operate longer, injecting more heat into the system to maintain the humidity setpoint and requiring the unit to cool more to maintain space temperature. Since humidity sensors lose their calibration faster than temperature sensors, technicians should verify them every six months to a year for accuracy. Technicians also should check airflow sensors for accuracy — not necessarily at the VAV level but at the AHU level. Many new controls systems use airflow sensors to maintain the proper amount of outside air brought into a unit for ventilation purposes. In free-cooling mode, there is no concern for energy waste, but in mechanical heating and cooling modes, there is. These air sensors typically are installed before air filters. Dust, debris, rain, and snow pulled into the unit can impact these sensors, causing the tiny holes measuring velocity and static pressure to plug. Also, water can get into the sensor and keep it from reading correctly. This issue will result in lower airflow readings, which will modulate the outside air dampers to open, causing the system to condition more outside air than required. Technicians should clean these sensors and check them for water inside during regular system preventive maintenance. Typically, these sensors have poly tubing installed that can hold water. This problem is actually quite common, though many system operators might not know about it. Hydronic systems typically are tricky to deal with. Often, systems use a water-flow sensor to calculate BTUs, but some systems also use them for control. Typically, for primary/secondary pumping arrangements on chilled-water systems the primary flow should be greater than the secondary flow to ensure the primary water is going out to the building, instead of the secondary water return mixing with the primary through the piping bridge. Most hydronic systems have no means of verifying flow-sensor calibration easily with a third-party device. Technicians can verify these sensors using pump curves. If pump curves cannot be obtained, technicians will need to remove the flow sensors in the water stream and physically inspect them. These sensors can lose calibration due to water or glycol conditions. Poor water-treatment programs will harm flow, pressure, and temperature sensors in a hydronic system, and degradation can occur quickly.